The Geological Prize Called Haiti ? Somewhat to my surprise my most highly read article of the past week was an off-the-cuff pointer to some tinfoil about oil in Haiti. F William Engdahl (one time peak oil theorist and now vociferous anti-peak oil and anti-global warming theorist) has taken to the story like a duck to water, floating his now familiar theory about abiotic oil and suppression of oil production - The Fateful Geological Prize Called Haiti. I guess time will tell if Haiti does have any oil or if this is all just some colourful theorising from the fringes. A President becomes UN Special Envoy to earthquake-stricken Haiti. UPI has a report on yet another Australian LNG project, this one in the Timor sea - GDF Suez, Santos reach Australian LNG deal. French energy giant GDF Suez signed an agreement with its Australian partners at Santos to develop three offshore gas fields in Australia, the company said. GDF Suez announced a $200 million deal with Santos that concludes plans launched in August to develop its Bonaparte liquefied natural gas project. The integrated project envisions the construction of a floating liquefaction plant with a capacity to produce more than 2 million tons of LNG per year. The project relies on gas resources from the Petrel, Tern and Frigate gas fields in the Bonaparte gas basin in the Timor Sea, which GDF Suez described as one of the richest gas regions in Australia. Kevin Drum has an article on profitable (for the buyer) forms of energy efficiency investment - Climate Change's Low-Hanging Fruit. ....Not surprisingly, those rules were attacked by business groups as bureaucratic job killers. Rosenfeld, who received his doctorate from the University of Chicago, was called unqualified by critics at Pacific Gas & Electric Co., one of California's largest utilities. Yet these mandates have yielded about $30 billion annually in energy savings for California consumers. They've eliminated air pollution that's the equivalent of taking 100 million cars off the roads. They have been copied by states and countries worldwide. California's gains are so closely linked to Rosenfeld that they've been dubbed the Rosenfeld Effect in energy efficiency circles, where the 83-year-old has taken on rock star status. Rosenfeld's ideas, far from being job killers, have been a boon for California. We have plenty of problems here in the Golden State right now, but better energy efficiency isn't one of them. In the end, Rosenfeld was right and his critics in the corporate world were wrong. The point of the chart is simple: Some energy efficiency measures have a net cost and require fairly careful analysis to decide if they're worthwhile. Those things are shown on the right side of the chart. But there are lots of efficiency measures that not only reduce greenhouse gas emissions but produce net cost savings at the same time. These are the low-hanging fruit of climate change, otherwise known as "no-brainers." There are tremendous savings out there for the taking. Stuart Staniford at Early Warning has a post on the state of play for gas-to-liquids projects around the world - Gas-to-Liquids Production Statistics. Start also has a post on coal to liquids - Coal-to-Liquids Production Statistics. So, in today's adventure in much-harder-to-find-than-they-should-be energy statistics, I try to assemble some kind of series for global production of synfuel from coal-to-liquids (CTL). This went even worse than the tar sands. However, I think I have figured out the big picture, and I report my findings here for the benefit of future energy sleuths, or in the hope that someone will point me at better data if it exists. Firstly, for the sake of readers just getting up to speed, what we are talking about is the possibility to use various kinds of chemical transformations to make a petroleum-like liquid fuel from coal. 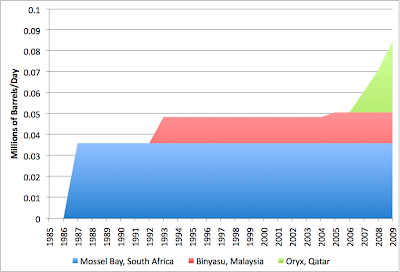 See the Wiki entry on coal liquefaction for more details of the various possibilities. This was done most famously by the Germans during World War II, and has been done for a long time in South Africa; the South Africans needed to get around economic sanctions during the Apartheid era, and that country has a lot of coal and not much oil. Since there are huge amounts of coal underground around the world, CTL is often cited as a potential substitute for oil in future (generally by folks not worried about climate change). 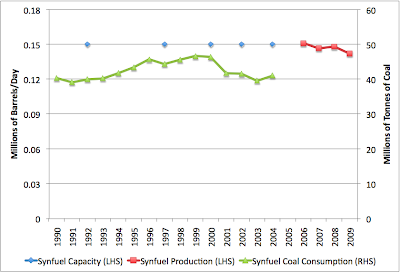 Overall, the picture seems to be that South African production of CTL synfuel has been roughly flat for many years. There are some fluctuations, but there is certainly not an overall upward trend. The data situation for the new plant in China is even sketchier. According to this page, the capacity of the plant is 1 million tonnes per year, which is about 1/7 of the output of Sasol in South Africa. It reached full production some time in mid 2009, so there would not have been a full year of production in 2009. Thus, at this time this represents a rather small increase in total global production of coal to liquids - perhaps of the order of 5-10%, with a little more coming in 2010 with, I assume, a full year of operation. Shenhua does have plans to increase the plant capacity to 3Mt in the future, which would give another increase when that occurs. Amusingly, the CTL plant is located in a place we have already referenced on this blog: Ordos. Todd Woody has an article at Grist talking about the benefits of expanding the smart meter / smart grid idea from the electricity grid to the water supply network - Smart meters save energy, water, and dollars. Smart grids continue to be the one area of the cleantech world that is really booming this year, so I'll do a little roundup of recent articles. EETimes points to a recent report predicting their will be over 200 million smart meters deployed by 2014 - Report: Smart meters rise to 212 million in 2014. Deployments of smart electricity meters worldwide will rise from 76 million in 2009 to reach about 212 million in 2014, according to a new report from ABI Research. The report provides forecasts of the wired and wireless communications options used to connect meters as well as profiles of some of many smart meter makers. The move to smart grids and two-way meters to enable new services to the home got a $3.4 billion boost from economic stimulus grants in the U.S. this year, noted Sam Lucero, a practice director at ABI and author of the report. For its part, the European Union enacted a so-called Third Energy Package in September which aims to migrate every European electricity meter to a capability for two-way communications by 2022. China is said to be ramping up its own smart grid programs, Lucero added. Smart Grid News has a look at some possible changes to the energy market configurations as a result of smart grid implementation - Why Today's Utilities May Soon Be Obsolete (and What May Replace Them). * Who makes the decisions? * How is control exercised? These crucial questions determine who applies the smarts to the grid and how efficiently those smarts realize the promise of Smart Grid technologies. Attempting to create a taxonomy of market structures risks over-simplification, but the resulting clarity can be insightful. This said, I argue that there are four market models that capture the critical elements of what will emerge when the Smart Grid is fully implemented. While elements of the four can be mixed and matched, at the core they represent extremes that require dramatically different deployment strategies in information and data flow, as well as end user decision and control. Reuters has a look at the smart grid investment landscape - How to make a play in the smart electrical grid: executives. The privately-held Silver Spring Networks is smart grid networking company and is often cited as a candidate for an initial public offering. The smart grid will allow two-way communications between utilities and their customers. Analysts have said it will marry clean power, electric vehicles, advanced meters, and power storage into a seamless network, modernizing thousands of miles of outdated power lines and allowing for more efficient energy use. Increased momentum for smart grid technology helped push power storage and energy efficiency stocks to perform the best on the WilderHill New Energy Global Innovation Index in 2009, which tracks the performance of 86 global clean energy stocks. The sector also has seen a boost from the Obama administration, which announced a $3.4 billion package in 2009 to help build a smart electric grid meant to trim utility bills, reduce blackouts and carry power generated by solar and wind energy. "Demand response is the killer application in this market, at least the first killer app," said Robert W Baird analyst Michael Horowitz. "These guys already have built fairly good business momentum over the last couple of years, as consumers and utilities alike are looking for better ways to manage delivering electrons," he added. While bigger players are moving into the sector, they may not be the fastest way to profit from the smart grid. Google has invested in smart grid player Silver Spring Networks while Cisco and Microsoft are seeking to leverage their existing networking and software expertise in the emerging sector. "Our view is the pure play companies are going to give a lot more bang. This is going to be very small to incremental for a company like Cisco and Microsoft," said RBC Capital Markets analyst Stuart Bush. Back at Smart grid News, a look at some of the issues that are cropping up as utilities try to phase out jobs like meter reading as smart meters are rolled out - Is the Smart Grid Inducing Labor Pains?. It seems that there is a bit of wire crossing happening amid the hardworking folks who are actually many of the hands and feet creating and managing the Smart Grid. In spite of very positive initial reactions to the federal investment of billions into the creation of the Smart Grid, the law of unintended consequences is introducing some consternation among the ranks of organized labor as Smart Grid programs move from philosophy to reality. While the introduction of the Smart Grid Investment Grant (SGIG) program was applauded by many in the labor community as the beginnings of a new market for skilled technicians, such as in this AFL-CIO blog post, or this IBEW promotional video, some actual deployments are not being greeted as positive changes. Most recently, on Jan. 19 the Kennebec Journal reported that IBEW Local 1837 was "speaking out against" a new smart meter installation project by Central Maine Power (CMP) that had been funded to the tune of $96M through the SGIG, and which had a total cost of roughly $190M. Seems that the project would likely eliminate, over time, some 141 positions, and that did not sit well with the union. The tension at CMP, however, is not unique. In October, a plan by the board of Memphis Light, Gas and Water Division (MLGW) received similar criticism from the IBEW, which noted that roughly 400 meter reading jobs would be lost in that plan. The Smart Grid is comprised of much more than just smart metering. It involves redundancy, and resiliency, and quality of power, and ease of integrating renewables, and storage, and on and on and on. Today's unfortunate reality, however, is that investment has been increasingly targeted to smart metering. Smart meters, and the improvements in automating, and "remotifying" the reading, turn-on, and cut-off of power, are seen as early wins. They do not appear to jeopardize the delivery of power, and can very quickly demonstrate cost efficiency by decreasing truck rolls. This is both a reaction to the government's emphasis of "shovel-ready" projects to fund, and to the ease with which a utility can justify the project to regulators as a cost-saver, paying off the capital cost in short order through a reduction in labor costs. As a result, the union teams, originally anxious to generate skilled labor to drive the construction of the next generation of transmission and distribution, is left, instead with a short-term need for installers that will be wiring up the elimination of hundreds of jobs for their meter reading brethren. Greentech media has a look at the top 10 smart grid news stories from 2009 - The Past and Future of Smart Grid. CNet has an article on a in-house energy usage display that is combined with a thermostat (I suspect we'll see a trend for convergence in home based control devices over time which mirrors that of hand held devices) - CES: To save energy, thermostat becomes mini computer. The thermostat is built around a 7-inch touch-screen display that runs Windows CE on Intel's Atom processor. It has a Wi-Fi interface that will allow it to get electricity usage information from smart meters and talk to network-aware appliances on a home wireless network. It has built-in speakers to play FM radio or music streamed from a home network. People can also use the device as a calendar. According to the company, SilverPac's in-home energy display will rely on getting information from a smart meter, which means that it won't be accessible to everyone. Even with millions of smart meters expected to be installed over the next three years, many utilities will not be making meter information available over home wireless networks, in part because of security concerns. Smart meter programs in Australia are still in their infancy - Western Australia recently announced the first step in a local smart meter rollout - IBM nabs WA smart meter deal . RESIDENTS in parts of Western Australia will soon be able to tell exactly how much power each electrical appliance consumes. Western Power hopes to roll out 10,500 smart meters as part of its smart grid project, aimed at helping customers identify consumption patterns. As a result, households and businesses could lower their power bills as smart meters make usage monitoring more transparent. IBM is involved in almost 50 smart grid projects worldwide, including local utilities Energy Australia and Country Energy. The federal government has pledged up to $100m towards the nation's first national smart grid. A government-backed smart infrastructure conference, ThinkFuture, will be held at Parliament House in Canberra on March 12. SmartMeters.com has an article on some turbulence being encountered by a smart meter rollout in New Zealand - Second thoughts about smart meters in New Zealand. A question has been raised in New Zealand whether the primary motivation for smart meter installations is so power companies can recoup funds from customers where were undercharged previously. Three major utilities – Contact, Genesis, & Meridian – are all installing smart meters throughout New Zealand claiming the devices will conserve energy and save money for customers. The devices allow for remote meter reads so human meter readers don’t have to be sent out. The smart meters also use information technology to record and display power usage. The New York Times has a look at consumer unhappiness with smart meter rollouts in the US as well - ‘Smart’ Electric Utility Meters, Intended to Create Savings, Instead Prompt Revolt. Millions of households across America are taking a first step into the world of the “smart grid,” as their power companies install meters that can tell them how much electricity they are using hour by hour — and sometimes, appliance by appliance. But not everyone is happy about it. Leo Margosian of Fresno, Calif., said his meter put July use at three times as much as last July's. Customers in California are in open revolt, and officials in Connecticut and Texas are questioning whether the rush to install meters benefits the public. Some consumers argue that the meters are logging far more kilowatt hours than they believe they are using. And many find it unfair that they will begin to pay immediately for the new meters through higher rates, when the promised savings could be years away. Power companies say the meters will allow utilities to vary the price charged to their customers by the hour to correspond to what those utilities are paying for energy in the wholesale market. This can help consumers save money, they say. Someday utilities hope to use the meter to control consumption by major appliances like air conditioners. But experts are still debating what technical standards the meters and appliances should use to communicate. The Energy Collective has an article on the need to educate consumers about the long term benefit of smart meter rollouts (though I think the fact that some smart meters just aren't that smart, or they help utilities adopt a utility centric model rather than a customer centric one - like the horrible example above of utilities controlling customer air conditioners rather than customers configuring their own response to high power prices, needs to be addressed - many of these programs are far from perfect) - Connecting the Smart Grid Dots One Meter at a Time. There are more signs that the brouhaha over PG&E’s smart meter rollout may do damage to other utilities’ plans for similar deployments. News reports indicate that utilities and regulatory agencies in other states are closely watching the legal tangle devolve in California. Consumer advocacy groups in California are concerned that smart meters are expensive, inaccurate and increase their bills, and only benefit utilities by eliminating meter reading jobs. This clearly demonstrates that they and the consumers they represent see the immediate impacts of the rollout of smart meters – a highly visible and disruptive new technology – as negatives. To them, the smart meter is an unwelcome revolutionary technology with no benefits to average ratepayers. They don’t know about its evolutionary role in the Smart Grid and how it will help ratepayers save money AND the environment. And why should they? It’s the responsibility of utilities, and maybe the Department of Energy (DOE) as well to educate consumers better about what Smart Grid technologies can do today and in the future. The DOE has developed a series of booklets that explain the benefits of the Smart Grid to various groups, including consumers, but clearly there need to be much more aggressive and coordinated campaigns to enlighten consumers. Does Joe Ratepayer understand that smart meters enrolled in utility programs will reduce or eliminate the need to build more power plants to address peak electricity load requirements? Does Jane Ratepayer understand that new power plant construction translates into higher electricity bills to recover costs? Could Joe or Jane intuitively understand how a smart meter saves them money and saves the environment too? Analogies can help explain the Smart Grid rollout process and the role that smart meters play. For instance, let’s say that I am building a new house with the kitchen of my dreams. I won’t get the benefits of that kitchen’s output until foundations to fixtures are installed. The smart meter is like my house’s foundation. There’s no home without a foundation. There’s no Smart Grid without smart meters. In building my new home, I understand that there is a start and a finish to the project. I have a blueprint to visualize the goal. I have a project plan to understand the process of achieving that goal. It is vital for utilities to connect the dots between current smart meter rollout activities and long term Smart Grid objectives. Ratepayers and consumer advocacy groups need equivalent blueprints and project plans to understand the long-term objectives in terms of what it means to their bills and the environment. The New York Times also has a look at experiments investigating the psychology of electricity consumption - Will 'Smart' Electric Meters Lead to Smarter Consumers ?. In conjunction with utilities, tech companies and state and federal agencies, Stanford University is doing a number of experiments to see how psychology affects people's energy consumption. "California has huge amounts of money to put toward marketing campaigns, and they spend it all on media marketing campaigns that we know don't work," said Carrie Armel, a research associate at Stanford University's Precourt Institute for Energy Efficiency. "Tens, hundreds of billions of dollars are going to be spent on installing smart meter technology. How much is being spent on behavioral research? Nothing. That's mind-blowing." Economists and policymakers have long advocated real-time pricing as a way to reduce consumption and smooth demand at peak times. California's 2001 energy crisis might have been avoided had customers had a direct incentive to conserve power; the state Public Utilities Commission has experimented with at least three different pricing mechanisms since 2003, and is currently aiming to install smart meters in the majority of consumers' homes by 2011. Stanford researchers are working on a dozen different studies on how behavioral patterns can create barriers to adopting new technologies and practices. The projects target four categories -- policy, technology, community and media -- with the aim of creating tools to tap into people's natural proclivities. Anthill magazine has a look at an ambient energy collection device being trialled in the UK - Switched-on innovation converts pedestrian footsteps into energy. Technology Review also has a look at harvesting energy from motion, in their case via a piezoelectric material called PZT - Flexible Sheets Capture Energy from Movement. Researchers at Princeton University have created a flexible material that harvests record amounts of energy when stressed. The researchers say the material could be incorporated into the soles of shoes to power portable electronics, or even placed on a heart patient's lungs to recharge a pacemaker as he breathes. The rubber material can harness 80 percent of the energy applied when it is flexed--four times more than existing flexible piezoelectric materials. Flexibility could prove vital if energy-harvesting technology is to take off. For example, the military tested stiff-soled piezoelectric shoes as a power source, but soldiers complained of foot pain. And previous flexible energy harvesters--based on piezoelectric polymers, nanowires, or other types of crystal--put out little electrical current. Vibration related energy harvesting also appears prominently in an article about unusual energy technology at Cleantech.com - Renewable energies you don't hear about every day. Israel-based Innowattech has developed a new alternative energy system that harvests mechanical energy imparted to roadways, railways and runways from passing vehicles, trains and pedestrian traffic and converts it into electricity by installing generators beneath a road's asphalt layer. The company says it ran a successful trial along a ten metre stretch of road and plans to expand the trial to several one-kilometre stretches of road in Israel. It's not alone. Washington D.C.-based New Energy Technologies claims it's developed something similar (see New device for capturing kinetic energy from vehicles). Researchers are working to harness energy from movement — such as from walking and natural vibrations in the environment — by using “tunable” devices. While some devices already exist for converting kinetic energy to electrical energy, they’re limited to a narrow range of motions, or frequencies. But what about technology that could convert a range of vibrations instead of just a narrow band? Research in this area is going on at Duke university in North Carolina. Their technology is basically a small cantilever that releases power when strained. It is several inches long and a quarter inch wide, with a magnet on one end that interacts with nearby movable magnets. By changing the distance of the movable magnets, the researchers were able to “tune” the interactions of the system with its environment, and thus produce electricity over a broader spectrum of frequencies. Motion is also harnessed by M2E Power of Idaho, which is pursuing a batteries for the military that charge themselves by the movement of troops' bodies (see M2E captures $8M with kinetic energy). The objective: Generate power throughout the day so soldiers don't have to carry as many heavy batteries. The Lorax: "I speak for clean coal"
I've recommended Dr Seuss' excellent book "The Lorax" previously (and some of you actually bought it) and no doubt the good Doctor is turning in his grave as he watches his fable being butchered by a bunch of grimy coal merchants - Andrew Leonard has the story ("Unspeakable blasphemy: Dr. Seuss gets repurposed for a fossil fuel start-up company" - The Lorax: "I speak for clean coal". In these days of relentless political absurdity and unending economic travesty, you may sometimes feel as if your disgust meter has completely maxxed out. There's nothing left that will shock you, you might imagine, as you take a jaded swig of your martini and shrug wearily at the world's gaunt tapestry of injustice. And then you learn that a coal-gasification start-up has -- without authorization -- named itself after Dr. Seuss' environmental icon, the ("I speak for the trees") Lorax, in the deluded belief that if Dr. Seuss were alive today, he'd be a crusader for clean coal. And suddenly, your disgust meter goes to 11! And, yes, the name is inspired by the Dr. Seuss story, Farina said. "The Lorax is the protector of the truffula trees," he said. "We think this is the greenest use of coal." War is peace. Freedom is slavery. Ignorance is strength. And the Lorax endorses clean coal. EcoGeek has a post on a new solar thermal power tower design - Solar Beam-Down Plants For Cheaper Solar Thermal. Solar power towers have proven to be a fairly efficient way of converting solar energy into electricity. In a solar power tower, energy from a large array of mirrors focused onto a tower that captures the heat in some way, and then converts that heat to electricity using a boiler and turbine. It's a great system, but building that heat-resistant tower and pumping all of those fluids up and down can be pretty expensive. Which is why researchers at the Masdar Institute, the Tokyo Institute of Technology and Cosmo Oil are working together on "beam down" solar. Instead of having the heat-capturing system up on that big tower, a second set of mirrors directs the light back down at the ground where it can be captured by a system that doesn't have to be suspended many stories in the air. It's certainly cheaper than a traditional solar power tower. The bad news is that the extra set of mirrors lowers the efficiency of the system by about 20%. If that can be made up for with reduced capital costs, however, they could be in business. In the end, creating cheap ways of capturing solar energy is probably going to be more important than creating efficient ways. This link is a little old (from back in December) but its worth noting what the Australian Energy Market Operator (combining Nemmco's old electricity market operator role with that of the gas market as well) views as the outlook for the eastern states natural gas supply - Rise and fall of the gas provinces. THE gas market will see a fundamental shift over the next two decades as gas-fired electricity generation expands under the Federal Government's carbon reduction scheme. Victoria's gas reserves will plunge and Queensland will become the dominant gas supplier on the east coast. The forecast is contained in the first so-called ''Statement of Opportunities'' for gas released today by the Australian Energy Market Operator, which took over the running of the electricity market from the National Electricity Market Management Company earlier this year, and also took responsibility for the gas market. By the end of the two decades Victoria could be down to 10 years of gas reserves - or less - forcing it to consider sourcing gas from other states for the first time, which will boost its gas price significantly. NSW is likely to be forced to turn increasingly to Queensland for gas, although the wild card is locally sourced gas, as the exploration push for coal-seam methane gas gets under way in earnest in this state. According to the AEMO, NSW will experience a doubling in gas reserves from 2025, largely thanks to an anticipated rise in gas reserves around Camden, to Sydney's south-west, as less gas is available from Victoria. Reserves from other regions such as Narrabri and Casino, in the state's north, are not yet significant. The forecast suggests Queensland's domestic annual gas demand will treble to 458 petajoules by 2029 from 166PJ, and export demand for liquefied natural gas will reach 1302PJ by 2029. Victoria's annual demand will almost double to 403PJ by 2024. But the big change will come from an expected 55 per cent drop in Victoria's gas reserves to 4344PJ by 2029, equal to just 10 years of production. But strong economic growth between now and then could reduce it to just seven years of reserves by then. This anticipated decline will result from a rise in demand in Victoria, and elsewhere, coupled with falling reserves as Bass Strait's large oil and gasfields near the end of their life. At the same time, South Australia's reserves are expected to fall by a quarter to 1075PJ, equal to 14 years of production. Under these forecasts, NSW will need extra pipeline capacity from 2012, as well as Victoria, marginally at first but more significantly from 2017. ''All of the pipelines in Queensland … will be exceeded from between 2010 and 2013,'' the AEMO said. NSW will need additional gas pipelines linking to Queensland, which may result in the long-mooted Hunter to Queensland pipeline proceeding. In total, domestic gas demand in the eastern states will double to 1205PJ a year by 2029 from 626PJ now. Over this period the NSW annual gas demand will reach 199PJ, up from 130PJ now, but well below Queensland and Victoria, largely due to the lack of sizeable gas reserves in NSW, coupled with its higher price relative to other states. Recharge News has a report on a novel form of energy storage being implemented in southern California - Ice Energy begins 53MW storage project with SCPPA. Rather than building a new power plant to address peak electricity demand needs, Southern California Public Power Authority (SCPPA) will move some 64 gigawatt hours of demand a year to off-peak times using Ice Energy storage systems. The systems, which connect to existing building air conditioning (AC) units, use off-peak energy overnight to freeze 450 gallons (about 1,700 litres) of water in an insulated tank. The resulting stored energy, in the form of ice, is used to cool buildings during hot afternoons when electricity demand spikes to run traditional AC systems. Over the next 24 months, SCPPA will pay Colorado-based Ice Energy to install its systems on some 1,500 government, industrial and commercial buildings in the service territories of its member utilities. 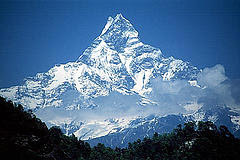 The project is equivalent to a 53 megawatt capacity peaking power plant. Terms of the deal were not disclosed. SCPPA and Ice say the project – which is an example of demand-side management – will contribute to grid stability, lower rates for customers, reduce greenhouse gas emissions and allow the integration of more renewable energy by providing additional load to balance off-peak renewable supplies. Carbon Currency: A New Beginning for Technocracy ? I normally only ever come across the Canada Free Press (I'm not sure what is "free" about a Canadian publication that worships America, but whatever) when people are spouting conspiracy theories about global warming and the apparently baleful influence of Canadian Maurice Strong. Today however I came across an article on Hubbert and the Technocrats and how their ideas about an energy based currency may be slowly coming to fruition via carbon credits - Carbon Currency: A New Beginning for Technocracy ?. Critics who think that the U.S. dollar will be replaced by some new global currency are perhaps thinking too small. It is plainly evident that the world is laboring under a dying system of price-based economics as evidenced by the rapid decline of paper currencies. The era of fiat (irredeemable paper currency) was introduced in 1971 when President Richard Nixon decoupled the U.S. dollar from gold. Because the dollar-turned-fiat was the world’s primary reserve asset, all other currencies eventually followed suit, leaving us today with a global sea of paper that is increasingly undesired, unstable, unusable. Unfortunately for individual people living in this new system, it will also require authoritarian and centralized control over all aspects of life, from cradle to grave. The social movement of Technocracy, with its energy-based accounting system, can be traced back to the 1930’s when an obscure group of engineers and scientists offered it as a solution to the Great Depression. If M. King Hubbert and other early architects of Technocracy were alive today, they would be very pleased to see the seeds of their ideas on energy allocation grow to bear fruit on such a large scale. In 1933, the technology didn’t exist to implement a system of Energy Certificates. However, with today’s ever-advancing computer technology, the entire world could easily be managed on a single computer. * Today’s goals for implementing Carbon Currency are virtually identical to Technocracy’s original Energy Certificates goals. Of course, a currency is merely a means to an end. Whoever controls the currency also controls the economy and the political structure that goes with it. Inquiry into what such a system might look like will be a future topic. Technocracy and energy-based accounting are not idle or theoretical issues. If the global elite intends for Carbon Currency to supplant national currencies, then the world economic and political systems will also be fundamentally changed forever. What Technocracy could not achieve during the Great Depression appears to have finally found traction in the Great Recession. Technology Review has an article on a "Antireflective film which helps solar cells maintain their energy yield" - A Safer Way to Coat Long-Lasting Solar Cells. In the solar photovoltaic market, even the smallest improvement in efficiency can have a meaningful impact on manufacturers' bottom line, which is why antireflective coatings are so important. These thin coatings, which cause solar cells to appear blue, maximize how much sunlight is absorbed and reduce surface defects that can lower performance. Rohatgi and his team of researchers at Georgia Tech have spent the past 18 months working with Montreal-based Sixtron Advanced Materials on a new silane-free process for applying antireflective film to solar cells. During their work they discovered that the coating--a silicon carbide nitride material carrying the trade name Silexium--also reduces light-induced degradation by up to 88 percent. Crystalline silicon wafers, which are usually doped with boron, also contain oxygen. When sunlight first hits a new cell it causes boron and oxygen to combine, resulting in a 3 percent to 5 percent degradation in cell efficiency. The researchers found that when the Silexium film is added, some of the carbon in the coating ends up diffusing into the bulk of the silicon wafer. They believe the carbon competes with the boron to make a bond with oxygen. Because there's less oxygen for the boron to bond with, light-induced degradation is largely avoided. The Jakarta Post reports that Indonesia has lowered its target for geothermal power production - Govt reduces geothermal energy contribution. Indonesia has revised downward the planned capacity for geothermal-fired power plants under the second 10,000 megawatt (MW) crash program by about 700 MW as some of the initially proposed projects cannot be finished within the program time frame. The government initially planned to produce as much as 4,733 MW under the second 10,000 MW power program from geothermal power. But in its latest report, state power utility PLN said the electricity supply to be generated from geothermal energy will be reduced to between 3,975 MW and 4,077 MW. "After evaluation, we conclude some of the geothermal power plants will be difficult to complete by 2014, because the working areas are still green field sites. Therefore some units will be taken out of the program," Electricity and Energy Utilization director general J. Purwono told reporters Tuesday. The 10,000 MW electricity project is planned to make up for the lack of investment in power plants in the last decade which has contributed to the power shortages across the country.